Subir Roy: What does life hold for a rag picker? The shanties along the railway line for local trains near Park Circus station in east Kolkata are not so different from similar encroachments across the country. Many of them are home to rag pickers, who occupy perhaps the lowest rung in urban India’s social ladder. They are mostly Scheduled Caste and Muslim landless labourers who have migrated from nearby districts in search of work. 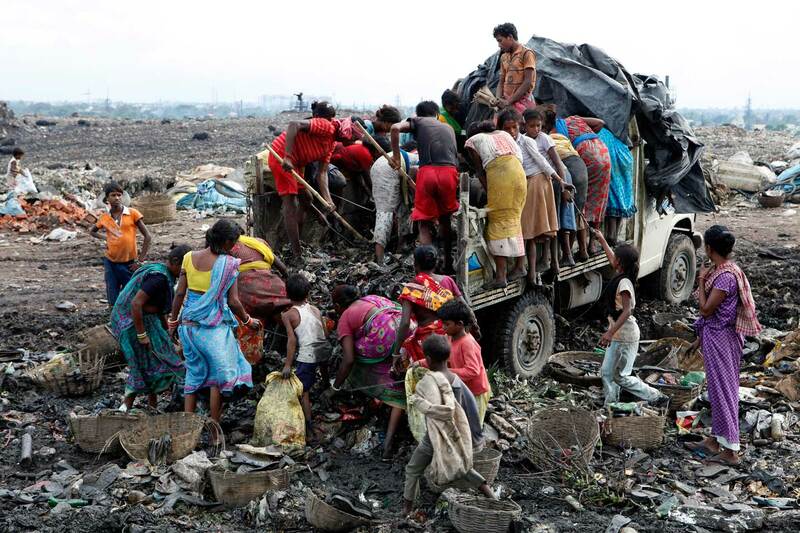 Across the country rural scavengers often escape to a better life in a city as rag pickers. This colony of rag pickers, who forage into garbage dumps across the city to fish out recyclables, has been there for decades now. One kindly light for some of them though is the Tiljala Society for Human and Educational Development, Tiljala SHED for short. Founded by a retired government schoolteacher, Muhammad Alamgir, it has for over two decades worked among rag pickers in mostly deprived slum-ridden east Kolkata, which has a large concentration of Muslims. Tiljala SHED was one of the 30 NGOs selected to participate in a daylong event in one of the nicer hotels in south Kolkata by Kolkata Gives. In the second such event in a couple of years, NGOs who make the cut (one criterion is a low expense ratio) were invited to man kiosks and the rich and the good of the city invited to come, see, select a worthy cause and be generous to its NGO backer. Mudar Patherya, one of the organisers, says immediate commitments of Rs 4 crore have been made and more is expected to come in with time. Tiljala SHED runs several programmes, but the flagship is one that covers 350 rag pickers and 50 ultra-poor families. It is supported by the German Roman Catholic charity Misereor. Just next to the shanties lining the railway line is a one-room school for rag pickers’ children in a proper “recognised” slum. They all go to government schools earlier in the day and in the afternoon come to this one which is more like a “coaching” class. They need this additionality as their parents are all illiterate and working most of the day. The shanties are as makeshift as they come – but even then, some of them are two-storied! You enter and go to the upper level by a ladder. The clearance for both levels is low, you bend a little to get in, to sit or lie down. Sometimes two families share such a shanty. Levels of well-being differ greatly between shanties. Clearly at the top of the heap is Munni Molla, a grandmother and secretary of a self-help group. Her husband does paint jobs at Rs 400 per day. There is electricity to power a couple of lights, fans and a TV, at Rs 360 a month, plus Rs 200 per month for a cable connection to a dish antenna. Easily the apple of her eye is Nazia Khatun, her granddaughter of eight who has stood first in her class. All proudly point to a picture on the wall drawn by the little girl showing the teacher in her class holding a pointer to the blackboard. Munni Molla has an Aadhaar card and a bank account. The big recent event at the shanty town was a nationalised bank setting up camp to open around 250 Jan Dhan Yojana accounts. But the lot of the average rag picker is far different. A full family of grownups and children earns around Rs 300 a day by selling to aggregators what they collect. They don’t save and spend all they earn right away. Addiction is widespread. The monsoon months are particularly bad as rain washes away the waste paper, a major recyclable, in the garbage heaps. One of the biggest disappointments of Tiljala SHED is the result of their attempt to teach rag picker women vocational skills like tailoring, making paper bags and processing spices. Rag pickers don’t like regular routine like attending training classes and will refuse a cleaner job than what they do if it earns them the same as rag pickers. MNCs like Cognizant give away a lot of waste paper but it is a headache getting the rag pickers to land up at an office at the appointed hour to collect it. Even then, it is difficult to sell what the training centre produces. Shops say consumers prefer to buy branded packaged spices. It is a humbling moment for any upper middle class do-gooder when the realisation dawns that, unless the very poor have a stake in the future, they do not become aspirational.